Please reproduce and distribute throughout your formations as needed. 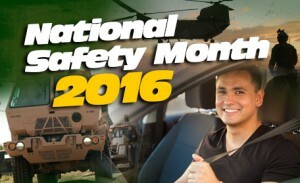 Remember, risk does not keep a calendar, so use National Safety Month to strengthen your safety programs now and into the future. Army Safe is Army Strong! You would never consider drinking and driving, but do you feel the same about drinking and boating? If you’re ready to enjoy warmer weather from behind the stern, throwing your beer cooler in along with your skis and fishing gear isn’t a good idea. In fact, it might get you killed. Drinking is the leading known contributing factor in fatal boating accidents, comprising approximately 21 percent of deaths and rising, according to the U.S. Coast Guard. “Many boating accidents involve alcohol, and Soldiers need to understand drinking and operating any type of watercraft, including jet skis, carries the same safety risks and criminal penalties as operating a motor vehicle under the influence,” said Tracey Russell, Ground Directorate, U.S. Army Combat Readiness Center. After alcohol use, the top causes of watercraft accidents include operator inattention, improper lookout, operator inexperience and excessive speed. Weather can also affect operator proficiency. In 2014, the Coast Guard reported 4,064 accidents that involved 610 deaths, nearly 2,700 injuries and approximately $39 million in property damage attributed to recreational boating mishaps. In addition to staying sober, boaters of all ages should take the simple yet critical step of wearing a personal flotation device. For additional information on boating safety, visit https://safety.army.mil. Driving off the road is bad enough, but overcorrecting only makes it worse. “Overcorrecting is often indicative of running off the road and overreacting by jerking the wheel to get the vehicle back on the roadway,” said Walt Beckman, Driving Directorate, U.S. Army Combat Readiness Center. “It’s usually due to inattentiveness, fatigue, or failing to maintain contact with the road in a curve.” Motorists who exit the roadway and then overcorrect create a loss of control event, which is a small but deadly component of the Army’s overall accident numbers. “Those loss of control accidents accounted for roughly 15 percent of the 46 PMV fatalities recorded in fiscal 2015,” Beckman explained. “Loss of control in almost all cases is associated with another causal factor such as speed. In contrast, 17 of those 46 accidents, or 37 percent, were solely attributed to indiscipline such as speed, failure to wear seat belts or alcohol use.” Overcorrecting often leads to rollovers, which are the deadliest of vehicle crashes. According to the National Highway Traffic Safety Administration, rollovers comprise only a fraction of total accidents but cause a disproportionate number of fatalities. For example, of the 9 million vehicle accidents reported in the United States during 2010, 35 percent of fatalities occurred during rollovers, which represented only 2.1 percent of total accidents. Nearly 70 percent of those victims were not wearing seat belts. Soldiers can best protect themselves from rollover events by following established rules of the road. Articles written by: Art Powell, Directorate of Communication and Public Affairs, U.S. Army Combat Readiness Center.